There are always two landscapes in a Malouf story. The one you can touch with your hands, and the one that is dreamed – discoverable by language, always on the verge of disappearing. In medieval Japanese art and letters, this quality was known as yūgen (幽玄),which might be translated as ‘shadow-filled’ or ‘beyond words’ or ‘that which resists being clearly seen’. Arthur Waley, translating fifteenth century playwright and pioneer of Noh, Zeami Motokiyo, said that wandering in a great forest without thought of return is a path to yūgen, as is standing on a shore and gazing after a fishing boat that disappears behind an island, or seeing wild geese disappearing into white clouds. Kamo-no-Chomei (1155–1216) wrote in his Mumyō-sho (Treatise Without a Name), that yūgen occurs, ‘when an unseen world hovers in the atmosphere’. As the son of an English-Jewish mother and Lebanese-Christian father, it is easy to imagine the young Malouf hearing stories of the world that existed beyond Brisbane – the world of his elusive heritage, but which seemed to have no real bearing on life as lived daily. A thing that could be believed in or not. It is no surprise, then, that Malouf’s stories are fascinated, not only with the world of dreams, but the way dreams persist across time and space. In ‘A Traveller’s Tale’, an Arts Council lecturer and specialist in the famous Australian-born Opera singer and diva, Alicia Vale, travels to a small hinterland town between Coffs Harbour and Brisbane. There he runs into an unremarkable outback woman, Mrs Judge, who claims an intimate knowledge of his favourite subject. In India, at age twelve, she was married to a minor prince; she bore the prince a child that was snatched away by a rival faction. Alicia Vale met and claimed the woman – still a child then – whilst on holiday in India. And so the symbol of exotic adventure and the truth were unwittingly united. At first, we assume the ‘traveller’ of the title is the lecturer, gone from the city to the outback; then we assume it’s the diva, then the daughter, and at last we realise it is a romantic dream of the East in the early twentieth century that has travelled in various forms, and must now travel again in the lecturer’s writing. Other writers have written of dreams and ideas that have a life of their own and particular trajectories through time. Jorge Luis Borges comes immediately to mind. 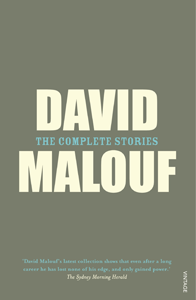 But what make’s Malouf’s stories unique is his awareness that in Australia – so isolated from the world, so insular and empty, so suspicious of the life of the mind – the dreams could run aground. Malouf’s concern with dreams running aground is never so profoundly treated as in the remarkable ‘The Only Speaker of His Tongue’, where a Norwegian lexicographer meets with an aboriginal labourer whose people were massacred fifty years ago. The man alone survived. Now he digs fence posts at the edge of an empty plain. Here, Malouf meditates upon an entire world being lost. The story is doubly poignant in that the lexicographer, as a Norwegian man of letters, is himself the keeper of an ancient and rich language, which is threatened by the global lingua francas. The darkened state of wordlessness is the one Malouf puts us in again and again. In the two stories discussed thus far, that darkness is threatening because it represents a realm of inaccessibility. But this is not always the case. There are two kinds of darkness in Malouf’s stories: that which exists after language has been taken away, and that which exists before it has been conceived. Plainly, the ‘dark’ here is not a place of nothingness, but one of abstract ideas and forms that exist as blueprints for our experience (that is, a place of Platonic archetypes), waiting to be conceived into reality by language or matter. One of Malouf’s earliest stories, ‘Eustace’, evidences the author’s fascination with the nameless, archetypal forms that exist in the dark. What is striking is the ability for the subject to enter into and dip out of the dream at will, and experience its remaking of the real world. The girl and boy end up running away, to where and what end we are never told, but the dream of their trysts and ultimate escape now becomes a dream of romance and escape that resurfaces in the minds of the other girls in the dorm at significant and trying times in their lives, when it is most needed. But to take a momentary step back, what delight the reader feels in imagining the girls and their ‘dream hamster’, which moves around the school in the twilight hours as they are never allowed to, a dream and a reality at once. Here we perceive the ambient virtues of darkness as half-knowing. One of the collection’s finest and most recent stories, ‘Towards Midnight’, has a woman in a Tuscan house witness a man climbing nightly into her pool to swim. Late each night she awaits his arrival, with a sense of joyful anticipation. She enjoys the ambience of his swimming in the dark below her patio, without ever needing to discover who he is, his reasons, or make contact with him at all. This ambience, living side-by-side with a beautiful and paradoxically familiar unknown, brings her healing and peace at a time when she feels her life is unravelling. The peace – the beauty – is in the knowledge of dim forms, of things seen in half-light, things moving just beyond our understanding, which give the sense of infinite possibility. Ambient literature may seem a strange term, but it has currency. It is a concept known to the Japanese, and those involved in Japanese literary studies*. ‘Towards Midnight’ suggests the virtues of ambient darkness, and with simple imagery and ‘comfortable mystery’ (a chief tenant of ambient writing†) it achieves this liminal space for the reader. Malouf claims the heritage of Flaubert, Zola and Balzac. In valorising imagination as he does, he is of an older tradition: that of Wordsworth and Blake. In his treatment of darkness and silence, he is accidentally of the tradition of Murasaki Shikibu and Basho. Malouf is a poet of the dark but, as all true poets must be, a lover of order. He looks into the dark to reassure us there is an order there when we close our eyes. * See, Paul Roquet’s paper “Ambient literature and the aesthetics of calm: Mood regulation in contemporary Japanese fiction.” The Journal of Japanese Studies 35.1 (2009): 87-111. † ‘…translucent simplicity plus comfortable mystery governs the emotional architecture of ambient literature’ (Roquet 2009, 96). Brickhouse, T, ‘Plato: The Theory of Forms’, Internet Encyclopedia of Philosophy, viewed at < http://www.iep.utm.edu/plato/#SH6b>. Richie, D 2007, A tractate on Japanese aesthetics, Stone Bridge Press, Berkeley. Roquet, P 2009, ‘Ambient Literature and the Aesthetics of Calm: Mood Regulation in Contemporary Japanese Fiction’, The Journal of Japanese Studies, vol. 35 no. 1, pp. 87–111. PATRICK HOLLAND is the author of five books including The Mary Smokes Boys which was shortlisted for the Age Book of the Year and longlisted for the Miles Franklin and The Source of the Sound, which won the International Scott Prize and was shortlisted for the Steele Rudd Award. His most recent novel, The Darkest Little Room, is a thriller set in Saigon. He is a minimalist in the tradition of Ernest Hemingway and Arvo Part. He lives in Brisbane.